-- Indian Cultural Center of South Jersey is a well-known event organizing center for wedding, banquet, reception, baby shower, birthday parties, cultural event and many other celebrations. -- Indian Cultural Center is a project of Indian Temple Association Cultural Center (ITA-CC) This project was started in 1980's when the leaders of ITA sought a bigger and better place to complement Cultural activities of Indian Community in Delaware Valley. 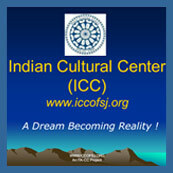 Indian Cultural Center achieved a milestone. Latest details regarding wedding halls in south jersey, reception halls in south jersey, banquet hall in south jersey. -- Local Indian Organizations in South Jersey are like Asian Indian Professionals, BAPS at Cherry Hill, Bengali Cultural Society, Council of Indian Organizations are closely collaborated to IccofSJ. -- Events & Program organizer, special event hall, concert halls, community hall, banquet hall, wedding hall, event organizer south jersey - Indian Cultural Center. -- Monetary donation, stocks, assets donation are accepted by indian cultural center in south jersey. We value your donation at Icc Marlton nj. -- Photos of Banquet halls, Wedding halls, Reception halls, ceremony halls, birthday party halls, auditorium, concert hall, meeting rooms for rent in South Jersey.